Ahhh, toddlers. That beautiful stage full of curiosity, enthusiasm, joy… And tantrums. And opinions. And energy. Allllll the energy. 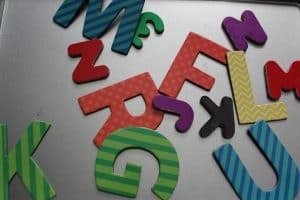 If you’ve got a toddler, you know that it can be hard to keep them entertained. They want to do everything, but there’s still a lot of limitations to what they can do. Restaurants, road trips, flights, dinner parties at non-baby-proofed houses- it’s enough to strike fear into any parent’s heart. But it doesn’t have to be that way (well, not ALL the time at least). We’re bringing you a collection of easy toddler busy bags and busy bags for babies for our Littlest Salties. Someone at McCormick is an accidental genius, because those little spice jars they make are the basis of my very favorite busy bag for toddlers. Clean it, fill it with Q-Tips, and let your little one put the Q-Tips back into the jar one at a time through the little holes on top. It’s self contained, small, and sooooo easy to put together. And costs nothing, so no one will cry if you lose it. Well, at least YOU won’t. 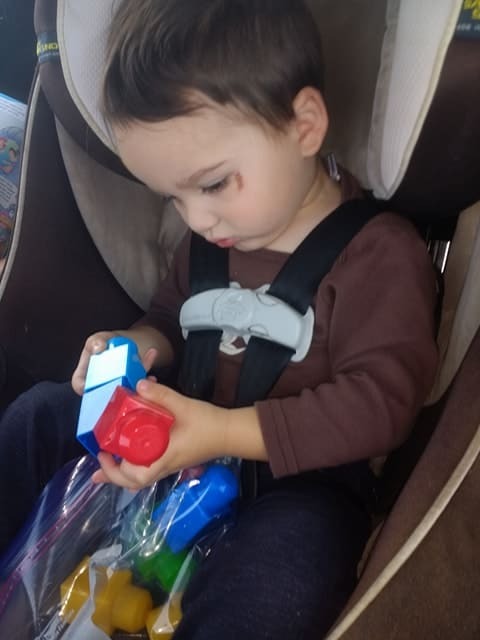 It doesn’t get easier than this toddler busy bag- put a few single duplo blocks into a Ziploc bag and you’re done with this one! Stack, sort, spill and clean up- there’s lots of ways for littles to have fun. 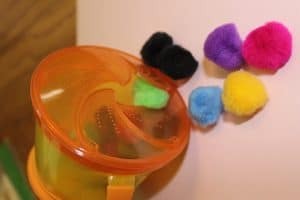 Abe loves to put pom poms in and out of this dollar store snack catcher (and let’s be honest- dump them out, scatter them, throw them, etc). You can also buy trainer chopsticks and encourage them to pick the pom poms up with those for extra fun. I have two versions of this- one in an oatmeal can and a more portable one that uses a mini-Pringles can (you know, the kind you pick up as you’re walking through Target because your kids are losing their minds and you have to at LEAST get to the diaper aisle before they totally melt down?). Anyways, you cut a slit about a quarter inch wide in the lid, and kiddos can drop a stack of playing cards into the can one at a time. For the mini version, consider printing the color learning cards we’ve got included in our Teaching Colors Post. The best thing about this one is that the activity is self-contained. The canister holds the cards for you, and they are easily dumped out to start again. Less is more with little guys, so a few crayons (three or four from a restaurant, for example) will do. I like to put these in a little ziplock bag with index cards (they are JUST the right size for this) and a few stickers. They are cheap, disposable, and the perfect size for little hands. As a bonus, we also use these to make little gifts when we’re on a road trip. We call them “postcards,” and make a goal of creating one for each person we’ll see on our travels. It’s a good way to extend the activity further when they’re starting to tire of coloring. You might be amazed at how young kids are able to do this. Use basic pony beads (you can often find them at the dollar store!) and pipe cleaners to make them easier to thread. Twist a little loop onto one end so that the beads don’t fall off the other side. Your little ones can string (and restring!) the same beads over and over again. 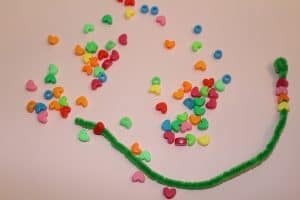 As they get older, consider asking them to make patterns, or sort beads on to the appropriate color pipe cleaner. I think you know this already, but you’re gonna need to use all the caution with this one. You know whether or not your kid is likely to put these in their mouth. If they are, rule this one out all together. If they’re not, still keep a close eye on them whenever they’re playing with small pieces like these. You know I keep cheap cookie sheets in my Activity Bag, but magnets are always a good choice to have on hand. You can use them at a friend’s house on the fridge, a napkin dispenser, or just play with them on a tabletop. I like the standard letters, and I also keep a set like this to change it up. We are obsessed with Melissa & Doug’s Water Wow books. They come with a little pen that you fill up with water. As kids draw with water, colors emerge. Once they dry, the colors disappear again, and the kids can start from the beginning if they choose. Full disclosure- these are for kids ages 3 and up, but I find that they worked even better for 18 month old Abe than they did for 4 year old Lila. No mess, quick results, and they don’t take up a ton of space. When Lila was little, I would fold up a piece of felt with some handmade shapes and figures (think animals, people, a Mr. Potato Head body and pieces) and store them together in a bag. Now? Yeah, ain’t nobody got time for that. I bought these farm felt shapes for Abe on Amazon and they’re a great time filler. Build a scene, talk about animal names and noises, play pretend- they pack a big punch with just a little space. 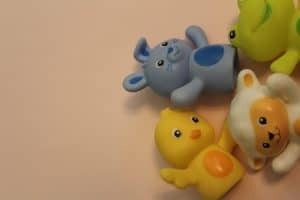 There are SO many fun sets (we are partial to the family set and the farm animals), and they are great for the kids to play with or for you to entertain them with. (Personally, I HATE putting on a puppet show, but desperate times and all that). And if you’ve got older kids with you, they can put on a “Daddy Finger” song and puppet routine (and read this post about the Daddy Finger song from Toot’s Mom is Tired. It’s HILARIOUS). 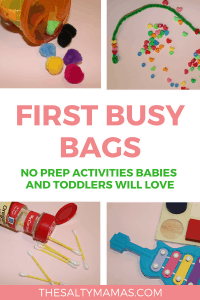 Looking for more no-prep toddler busy bags? 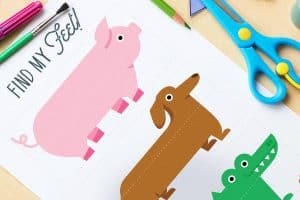 Check out these fantastic printable busy bag activities from PersonalCreations.com. We think our kids would especially love this cute little feet-matching activity. Find this activity- and many more!- here. 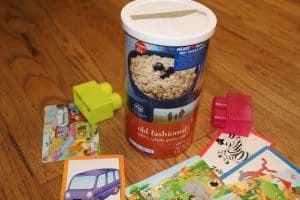 There are lots more ideas for busy bags for babies and toddlers, but these ten offer the most bang for your buck. With very little prep and lots of engaging play, these simple toddler activities will keep your little ones engaged for BIG amounts of time. What’s your favorite activity for your kids when you’re out and about? Tell us in the comments below! And don’t forget to follow us on Pinterest. We’ve got a full board of ideas to help keep your kids busy, happy, and having fun! I love these ideas so much! Ironically, I totally just used the dollar store cookie sheet and some princess magnets my daughter got for her birthday on our road trip. She loved it!!! 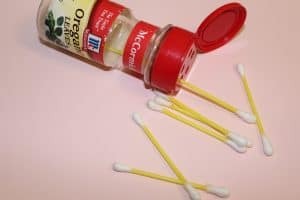 I have to try the Q-tips and spice jar, such a great idea! And I think were FINALLY ready for pony beads (she’s been a stinker about putting things in her mouth, but I think I finally trust her). Thanks for reminding me about using them with a pipe-cleaner! Keep the great ideas rolling! Don’t forget about lacing Froot Loops if beads make you nervous! And did I see that you did a CRAZY long road trip screen free?? Kudos, mama! Aww thanks for linking to me! I love your blog! Thanks for writing such a hilarious piece!